NFL Draft 2010: What Time Does The NFL Draft Start? Tonight is the start of the new NFL season with the 2010 NFL Draft! 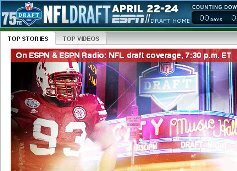 If you’d like, you can watch the live Twitter stream of the 2010 NFL Draft. Otherwise, one of the biggest circulating on the web right now concerning the NFL draft is simply what time does the 2010 NFL Draft start? The 2010 NFL Draft coverage will begin tonight (Thursday, April 22nd) at 7:30PM EST on ESPN. Live coverage will also be broadcast on ESPN Radio. One of the stories that have been overshadowing this years NFL draft is the situation surrounding Ben Roethlisberger. The Pittsburgh Steelers are, as much as I know at this point, unsure as to whether or not they will be trading their all star quarterback. The problem for the Steelers’ front office is that Ben has brought seriously negative press to their organization, and also that the NFL is enforcing a minimum of a 4 game suspension – possibly up to a 7 game suspension. This suspension will put Ben Roethlisberger out for a fair amount of the regular season. And again, will the Steelers’ want to put up with the controversy and the negative press coverage during this time? One of the main teams that are part of the Ben Roethlisberger trade rumors is the Oakland Raiders.